The smallest of the family of dogs which hunt by sight, the Italian Greyhound is believed to have originated in the Mediterranean region over 2000 years ago. Small Greyhound skeletons have been excavated in archaeological sites in these countries, but the breed gained its name after becoming popular in Italy in the 16th Century and has been depicted in Renaissance paintings and bronze sculptures. The breed has been a favourite of many of the Royal families of Europe and England, including Queen Victoria. 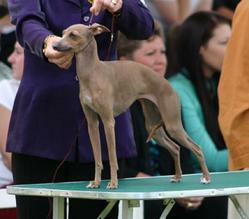 A tiny breed, weighing between 2.7 - 4.5kgs, the Italian Greyhound is a miniature of the Greyhound but much smaller and more slender in all proportions. He is elegant, graceful and quick moving with a high stepping gait. The Italian Greyhound may appear aloof, but with his family and friends he is affectionate and vivacious and remains playful long past the puppy stage. He loves a life of luxury and in the colder weather can usually be found beneath the bed clothes. A non shedding breed the Italian Greyhound has an extremely fine coat and very little fat cover and is essentially an indoor dog in cooler climates. 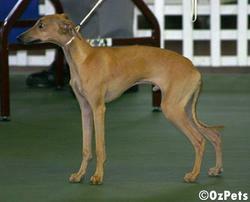 A characteristic of the breed is the habit of standing on three legs, alternating the leg raised. This little dog has such fine boned legs that his circulation is poor and he perpetually has cold feet and the habit appears to be the dogs way of keeping his feet off the cold ground. The delicate and fragile appearance of the Italian Greyhound belies his hardiness and the breed is long lived and rarely ill. The Italian Greyhound is adaptable for both country and city living, requires a minimum of grooming and can live happily in a flat, or enjoy outdoor activities. The Italian Greyhound is rather retiring in the presence of young children, preferring the more dignified activities of adults and is more suited to adult homes.